← Visio 2007 and 2010 drove me CRAZY when trying to print on larger paper – Solution! On a recent job, I was plagued with one of my ks.cfg scripts whereby everything would be getting configured, then BLAM-MO. I’d get dumped to the login prompt with no further configuration taking place. I correctly surmised that it was taking place around the creation of the vmkernel port for vMotion. However, I incorrectly surmised that it was something to do with my vmkernel syntax. After this happening about half a dozen times, I decided to fire up Snag-it’s video capture feature. I captured the entire install up to the point of failure. There was a “red blip” that happened when the install would fail. However, it was so fast that the human eye couldn’t catch it. I was hoping Snagit video capture would (I could’ve used Camtasia, but I wanted to try the built in snagit one. 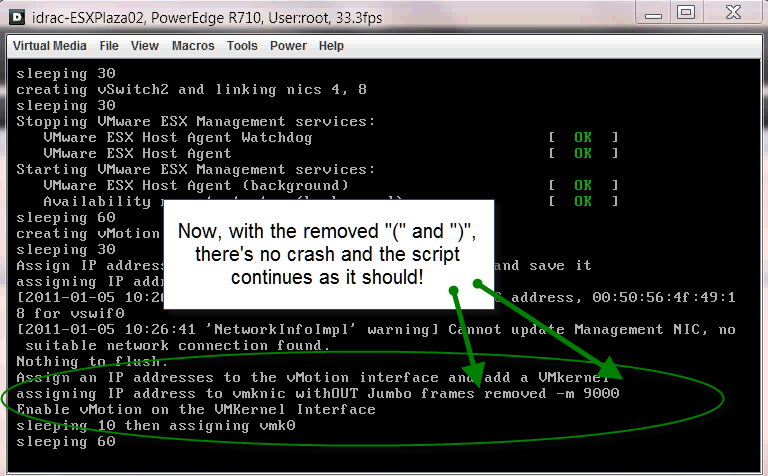 Thanks to snagit, I finally saw the error and corrected my script. 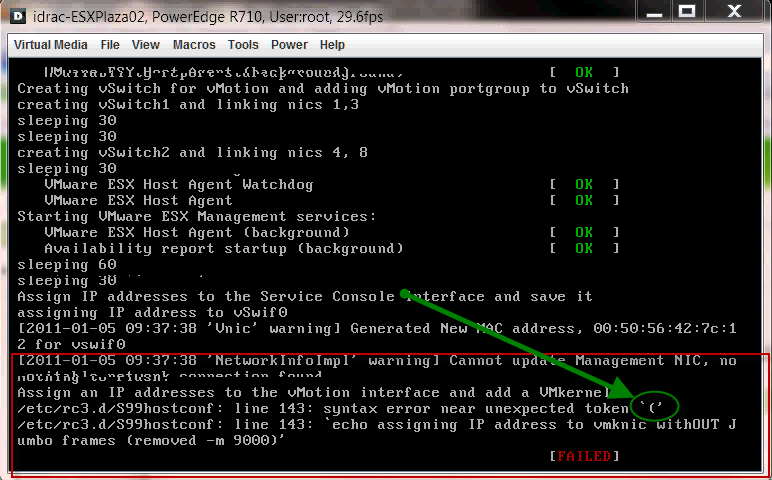 (It was a syntax problem, just nothing to do with configuring vmware networking as you’ll see). In my scripting I create a bunch of “echo” comments in order for me to know where the script is during the build. What I didn’t know is that you cannot have the “(” character in a “working” part of the script. That is, you may use ( within comments, but you cannot use them when the interpreter actually runs them….EVEN in an echo statement. Now the script works without issue. I hope this helps anyone out there so you don’t spend days debugging it!